Designed to capture the magnificent views of the Crazy Mountains, Crazy Peak Cabin is a beautifully furnished and fully equipped 40 sq. ft. cabin located at the mouth of Big Timber Canyon. 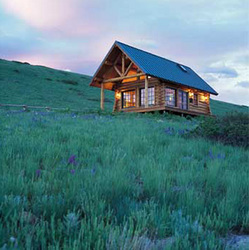 Surrounded by abundant wildlife, and unmatched majestic mountain scenery, Crazy Peak Cabin will provide for that very special Montana getaway. The cabin features a loft bedroom with a queen sized bed, a full bathroom including a claw-foot tub/shower, and a small, but fully equipped kitchen, The dining area is a log plank bar with seating for two. If you can get your eyes off of the mountain views, you will find the cabin finely furnished with the furniture which will entice you to 'sit a spell'. A gas hearth stove adds that final touch. Hiking, mountain biking, fishing, and all that the Crazy Mountains hand surrounding mountain ranges have to offer is nearby. A forest service trailhead providing direct access to high mountain lakes and magnificent mountain peaks is a 4 mile trip up the road. Fishing the Yellowstone, Gallatin, or Madison can all be accomplished either on your own or through the many outfitters available in Big Timber, Bozeman or Livingston. Horseback riding is also available through outfitters in the area. Day trips may include trips to Yellowstone National Park, the Absaroka-Beartooth Wilderness, the Boulder River, or the Beartooth Highway. Don't rule out a winter visit either as the area provides excellent cross-country skiing opportunities. Directions: Crazy Peak Cabin is located about 8 miles north of Big Timber along Highway 191, and an additional 8 miles northwest on county roads. The cabin sits on an open knoll overlooking Big Timber Creek, and sits at the mouth of Big Timber Creek Canyon on the east slope of the Crazy Mountains. Big Timber is about 70 miles (by Interstate) from the nearest airports located in Bozeman or Billings.